I woke up on Joanna’s couch in Kraków, showered, thanked her, then went over to the JCC. As they knew me by now and I had done some tech help there, the JCC staff was kind enough to stash my full backpack. Kneeling at my backpack in the closet, I quickly pulled out 3 shirts, 2 skirts, my long-sleeve cover top, and my toiletry basics, including one of my three 3-ounce Brincatti Refillable travel containers of shampoo, stuffing them into my red Chicobag fold-up daypack. My Mac, iRig Mic Cast and Samson Go Mic joined the daypack. Just in case, I pulled out my tightly-stuffed down sleeping bag and fit that into the cross shoulder Chicobag. Then the woman in the JCC closed the door on my backpack and I headed to the bus station, traveling light for a day or two in Tarnow. In the Jewish section where I got off the tram by the JCC, I’d been buying a traditional circular bread roll for 1.60 zl (50 cents) from the same man each day I walked by. My little tradition was nice and I enjoyed the smile and our hello. Today I missed that, so I bought one from another vendor for 1.40zl as I walked to the bus station. The JCC staff told me that no one goes to Tarnow overnight. That it’s not a tourist place; it’s where tours stop for a couple of hours and then go on to the mass grave and Auschwitz, which are nearby. 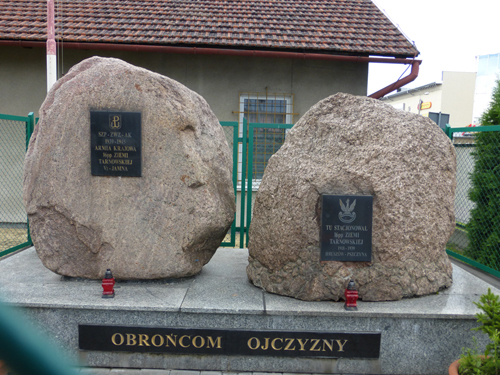 But I had family from Tarnow, and I wanted to know their lives and find out what happened to them when communication with the US ended. This was the start of a very long day full of travel and many miles on foot. I don’t often do this here, but I might just take you through my entire day. After pretty much walking through the train station on a confusing walk of asking people and following directions, I arrived at the bus station and checked my email as I waited for my bus. I was disappointed to find there were no responses to my Tarnow CouchSurfing requests. It was nearly 1pm. The bus takes one and a half hours. It seemed crazy to go so late. But something pushed me forward. The bus ride was easy. 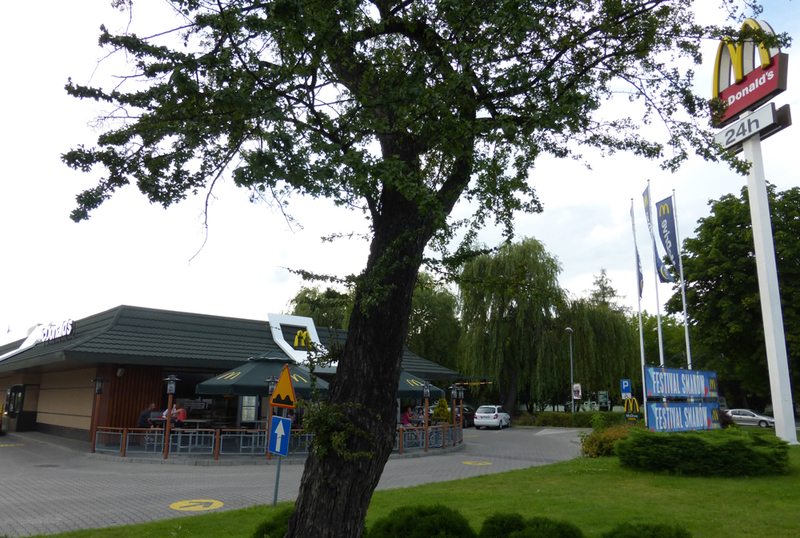 (Most of the trip out of Kraków was on new roads I’d been told.) I even slept on the bus the last 20 minutes or so and then we pulled into a modern station. The bus fare, by the way, was 14 zl (about $4.66). I got off alone. The station was empty. Only one open food shop but the person there wasn’t any help. This was not a station where I could get directions to a hostel or to town. Shortly after, another bus pulled in. I watched people get off my wondered if any of them were tourists like me but I didn’t see any signs of that and I didn’t hear English. This bus station is on a corner and at one of the opposite corners is a large-loping park with a big map installed at its corner. I decided to head over to it and see what clues it held for me. Tarnow bus station. Buses pull in on the left. The tree is where the park and map are. Crossing the street beside me were two women in their 30s pulling luggage. I asked them as they approached the same map, if they knew the town. They didn’t. We’d all been drawn across the street to a large map that said Tarnow region. What was the region? This wasn’t going to help us. The women were here for one night. They decided to go check the nearest hotel and invited me with them. It was a nice feeling to be invited. After booking themselves into the nice-looking Tarnow Hotel, they asked the manager if she had something for me. There was one non-remodeled room that the hotel manager was willing to give me for 80zl tonight rather than 90zl, $30. It sounded high for what I’d rather pay. She was very nice about it let me see the room and I know that I can return there if I need to. Bus station is below the dark circle, which is the Tarnow Hotel. The park is top left. Where I stayed is off the map at the top center. Click to enlarge. 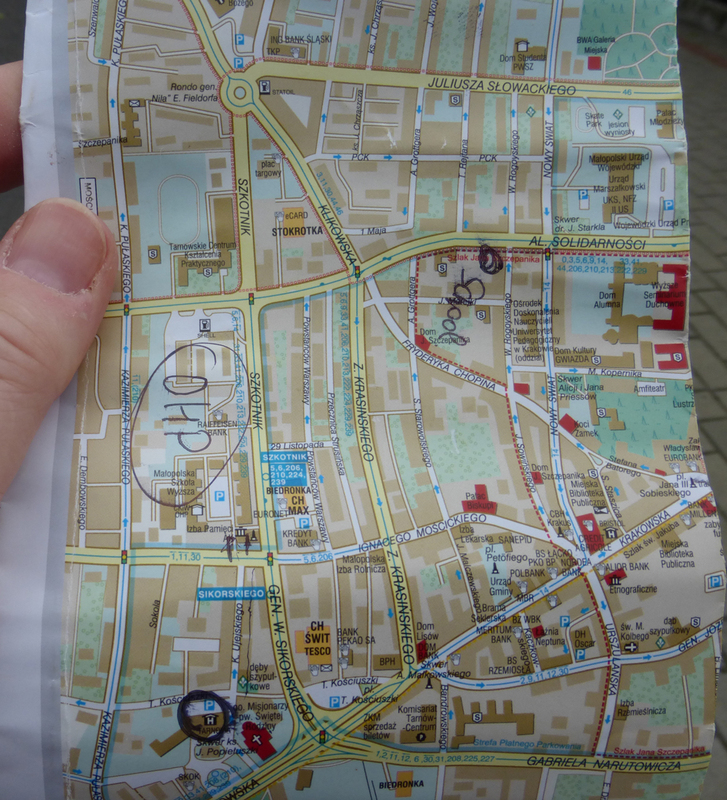 She also told me of another hotel, OHP, that was cheaper, and gave me this tourist map, marking where it would be. With this manager’s permission, I sat in the lobby and checked for replies from CouchSurfers and put into more requests giving each my phone number. Then I went exploring and hotel seeking. I turned left out of her hotel, then right to head what may be north, then right to get to this OHP hotel and/or head to the old city/city center. Soon after that right, I stopped at a small fruit stand with some older men and bought two great-tasting, good-sized peaches for .80zl – not quite 1zl and 1zl is about $.33. I had that kind of good feeling buying from those men and thought I’d like to return there again and give them more business. As I was near the OHP, that should be easy, I thought. That was the end of the block where I should have found the OHP hotel. A small shopping center straight ahead beaconed. 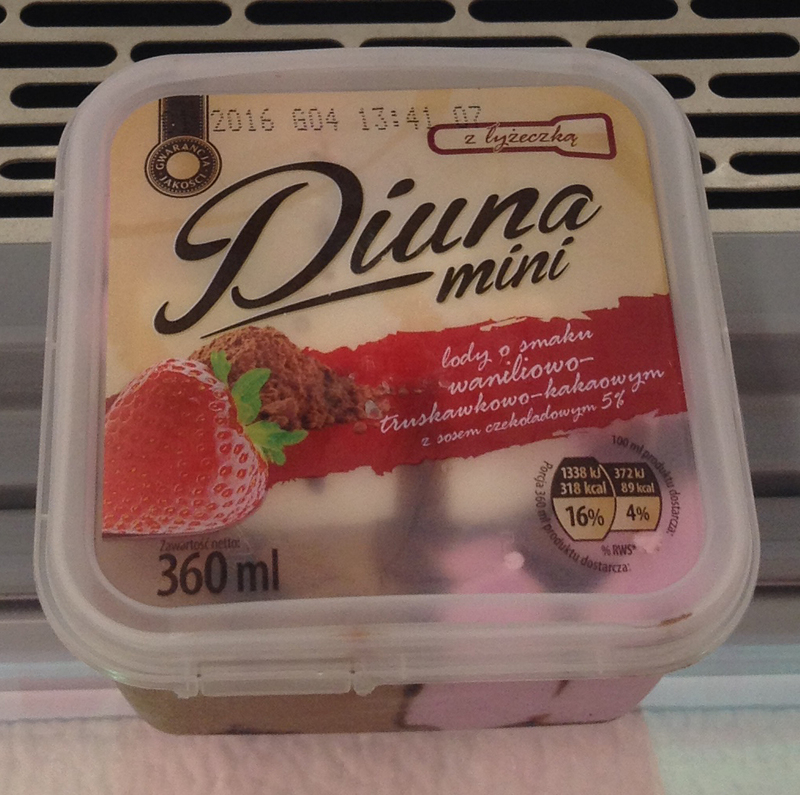 In the small supermarket there, I bought good-sized 360ml (3/4 pint) tub of chocolate, vanilla and strawberry ice cream with a Sunday-type drizzle of chocolate or strawberry sauce on top for just 1.75 zl (58 cents!) For that price I didn’t mind if I didn’t finish it all. Besides I had not had an actual meal yet this day. I also bought a box of cookies that I first fell in love with while living in London. They are a bit saucer-shaped and have orange flavoring the center and chocolate on top. At just 3.69zl ($1.23) I just had to try the Polish version, Paryskie. I sat on a bench outside the supermarket that opens into this tiny shopping mall and enjoyed most of my ice cream as I people-watched. A nice meal. Click to enlarge for cookie details. Click to enlarge for ice cream details. Then I continued my walk. 24 hour McDonalds with an outdoor patio. Click to enlarge. Heading north now, I came to a roundabout at another main street and a 24-hour McDonald’s on my left. I’ve taken a picture of because it’s modern it’s fancy as a diner. I noticed the Shell station beside it on my map and I knew then that I had passed the OHP hotel. I looked for the hotel around here, too, crossing the corner streets, then gave up on that hotel for now. I figured it’s not meant to be right now. And she didn’t say it was a hostel. Maybe it was another hotel I’d not want to spend much money on. I dictated my journal into Siri as I walked, so I’d have it to remember well. The school is on the right. Days later I entered and learned it would not have been where she attended. I found one of the hostels the map shows and it was more than I wanted to spend it was 63zl (about $21) for a night so I walked on. 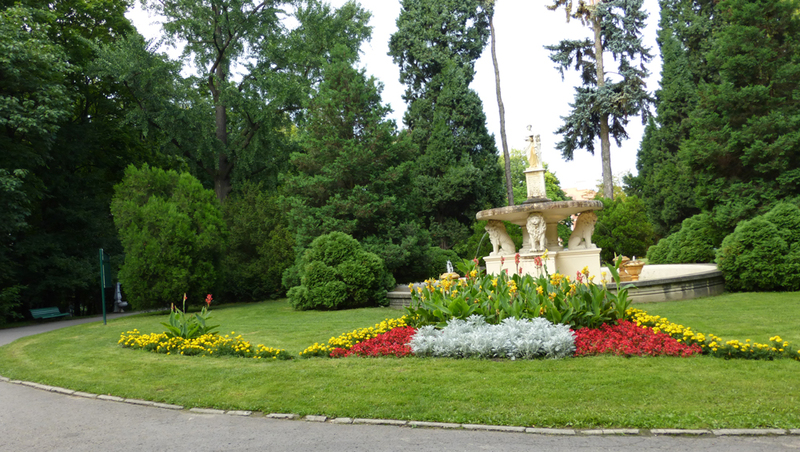 I needed to find a place to stay but I also wanted to see the park that was on the very next block and I didn’t expect to be in Tarnow very long to see it another time. 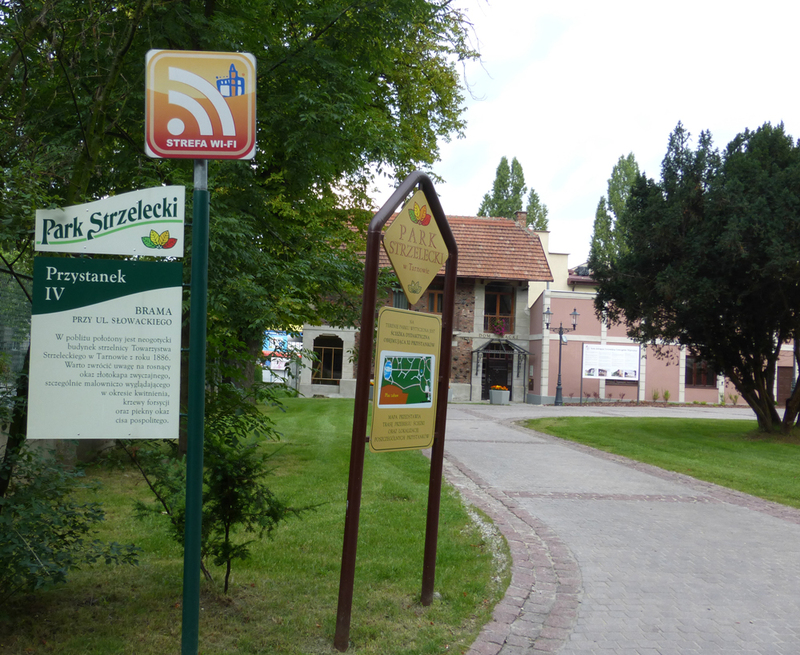 The sign informed me that Park Strzelecki is the Central Park of Tarnow. I turned to the right and found a bench just inside the park, near a wall of greenery. I enjoyed sitting there for a little while in a quiet corner of green on the bench and as I did I used my iPhone’s cellular data for the internet, I saw an email from mom and called my cousin Lisa over my Vonage Mobile app. After the rather long call, I realized I was getting bitten by mosquitoes so it was time to move on. I should mention that the rain had only been a few drops. Wondering how to proceed, I noticed a building that might still be open. It was an administration building. I knocked and a man came to the door. He didn’t speak any English, but I showed him the name of the second hostel, marked in a corner of this official map and I showed him the address of the hostel on my phone’s map. He pulled out a card and in 100% Polish while drawing lines on the map, gave me good directions. Those directions stated with walking through the entire park. I hadn’t been sure that was wise to do as it was getting dark. The man’s direction and the parents walking through with their children encouraged me to gamble. I’m very glad that I actually did walk it. In fact, I walked slowly, enjoying the fountains, people, other scenery, and the beautiful fragrance of the plants and trees after the light rain. 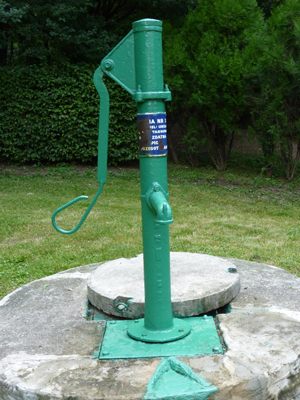 Green water pump in Park Strzelechi; my family must have used this pump. “I pass a green metal water pump and wonder: had my grandmother used that pump in her youth? I wonder about that everywhere I go here, whether my grandmother had been here and walked that street there. Just as I wondered about it even in Warsaw although that was less likely. When I exited the park I wondered who I might ask to help me interpret the park man’s line map. There was one dark-haired woman out walking. She might’ve been my age, but I think younger. She was walking alone and she didn’t know English, but somehow she permitted me to ask her anyway. I pointed to my map, to the address I sought. She smiled and I smiled. She said something in Polish and pointed so I knew that she was going in that direction. We walked together mostly in silence. At some point, although it wasn’t a long walk, I took out my iPhone, launched the Google translation app and held it up so she could repeat what she had said. Soon I knew: She had said it wasn’t very far. I said good and I smiled and we continued to walk in silence. As it turned out she was going to the same place. When it was time to turn onto the property, she went with me and saying something. Then she surprised me. We got to the big new building that said Student Dorm and Karabela, and she pointed to it – and said she was also going there. I wondered if she worked there. She pointed to the first car in the parking lot and said “my car” – in English. As we approached a small doorway where a nice woman guard sat, she told a friendly story. She told the guard how I’d approached her and asked for directions. Karabela student dorm – my home for several days. This guard turned out to be the front desk staff as well — and spoke no English. The Google Translate app on my iPhone was well used at Karabela. She escorted me upstairs and showed me the bathroom and kitchen and then a room. Clean and new and quite nice. A private dorm room with a narrow bed and a desk. I was thrilled. I worried about the price a little because I really liked these women and wanted to stay. I was thrilled – 40zl ($13) per night. Much better than $15 or $30. (Even though the Tarnow Hotel woman offered it to me for 80zl.) And it was nicer than the un-redone room at the Tarnow Hotel. The only catch was that I had only 35 zl in cash left. I pulled out the iPhone and app again and explained that I needed a bank. As I did, I offered her 30 as good faith for now so she understood I would get the money and stay. We went back downstairs and she gave me directions — in Polish. But I think I understood. To the corner and right. She offered me the room key again pointing to my bags. The tiny ChicoBag backpack stuffed and on my back was feeling heavy. Actually, I don’t think it was. I think the side bag with my computer is what has been pulling at my neck muscles. Anyway, I took her up on the key. It was really nice to put my bags down and be able to walk freely again. Returning down the stairs, I gave her my passport info. Business cards were on the desk so I grabbed one just in case I needed it to find my way back. So it turns out both of the buildings called hostels on the Tarnow city map are really student dorms. They just rent out the empty rooms. As it was summer, most rooms were empty. Turning from the hostel grounds onto the street, I stopped and pulled out my trusty iPhone and took a photograph of the hostel in case I needed to ask directions. Then I headed to the corner, stopped and took a photograph of the street signs as well. Then I turned made my right and kept on walking. As I walked, I realized what she was saying; there wasn’t a bank but there would be an ATM. Not too many blocks later on my right, I saw a parking lot in front of what looked like a small supermarket. I turned into the parking lot. A woman getting out of the car seemed like she would speak English so I asked if there was an ATM. She said she didn’t know but it would be inside. Of course. I went inside to the cash register area and back to the ATM. Funny thing though, as I was about to use the ATM, I noticed that the images were movie advertisements. For a moment I wondered if it was a video rental machine instead. So I went over to the cashier and I asked the cashier with a male customer. The man said it was an ATM. He walked over there with me and help me get started. He was very nice. As I was entering my pin he asked if I would be okay and headed out giving me privacy. I took out 300zl, approximately $100. That will last me quite a while. It hit me that it was a really good thing that I was in the supermarket because this was a residential area and there were no food stands. Very different from the many kebab stands that scatter the streets of Kraków. 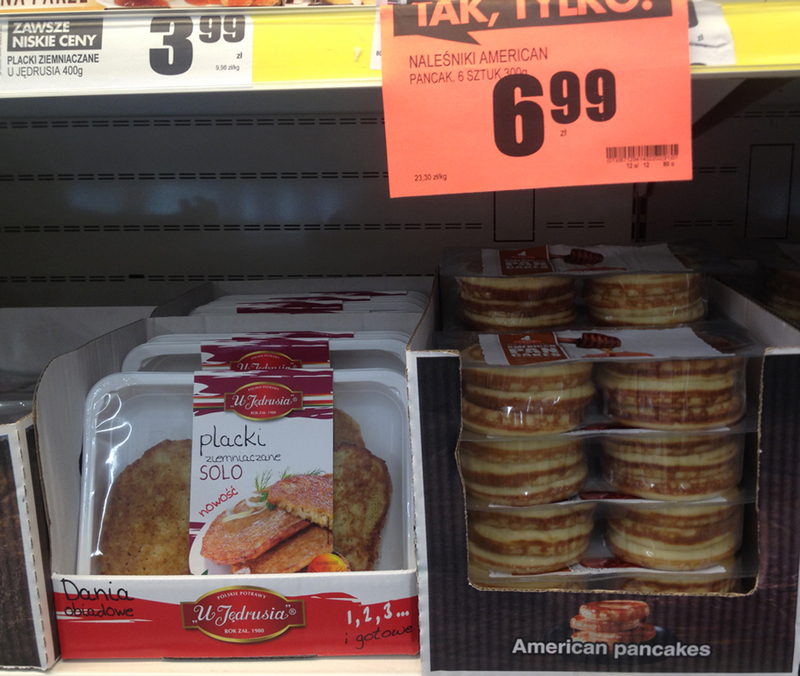 I looked around and in the fridge refrigerator section next to a package of pre-made American pancakes (which I find rather funny) was a package of potato pancakes (Place ziem). It was 3.99 zl ($1.25) for six pancakes, 400 grams, in a microwavable tray. It sounded like a good meal to me. I guess locals would think it’s crazy to buy potato pancakes but they were heaven as I ate them while writing this. I also bought a rather large individual yogurt, 250grams for dessert later for 1.99zl (66¢) — a better value than American yogurts. That yogurt, strawberry flavored, and half of the potato pancakes were my next day’s first meal. It was 8:45pm when I paid for this food with my debit card. The total was 9,26zl, about $3. I was, for the record, glad I had taken that street sign photo because the street looked different walking back and in a darker light. I did check that photo to find my way more easily. Before I ate though, I did something that I rather important. As there was a clothing drying rack sitting in the hallway, I first washed two pairs of underwear and the last two shirts that I wore/want. They were hanging on the clothing rack, well wrung out and in my room as I ate. Now all of the clothing in my pack will be clean. I will be well rested. (Having a single room means no worries about snoring or getting up to go to the bathroom in the middle the night.) The bed was rather hard but I didn’t care. And I hada pillow. Yeah! As I did some organizing and checking email I realized I left my prize electric adapter (the US to Europe adapter that I bought off a man as we boarded the airplane from LA) at Johanna’s. I went down to my friend at the desk just in case she had a US adapter. She didn’t, but she had a European USB charger and loaned it to me. With it, I am charging my Anker battery because that portable battery charges by micro-USB and then charging my phone with the regular USB output to my iPhone4s. Maybe will charge my camera too. I am without a Mac charger though for now. There is no Wi-Fi here though so Mac use would be minimal here. Having solved the charger, I paid for tomorrow night. I just liked having my own space. Having my raincoat hang to dry well, my towel and washcloth washed and drying my clothing drying. I hate packing every morning. We will see how this plays out over the rest of the year. For tomorrow at least, Tarnow is home. I read something for one of my clients. Work continues no matter where I am. She encouraged me to go to the nice mountain town near here and said she is sure they won’t mind if my backpack stays at the JCC. She will tell them on Monday for me. So I feel free. So that was my day. This dorm room remained my home for about 7 days. I looked forward to seeing the women downstairs as I left each morning. But guess what I found later that week? The OHP! Remember that fruit stand where I bought peaches my first hour in Tarnow? It was right across the street from the OHP. (I ended up staying there my last night so I could be much closer to the bus station. OHP is not a hotel. It’s really a school dormitory where you could rent a room in the off-seasons. But at the time, I had no idea.